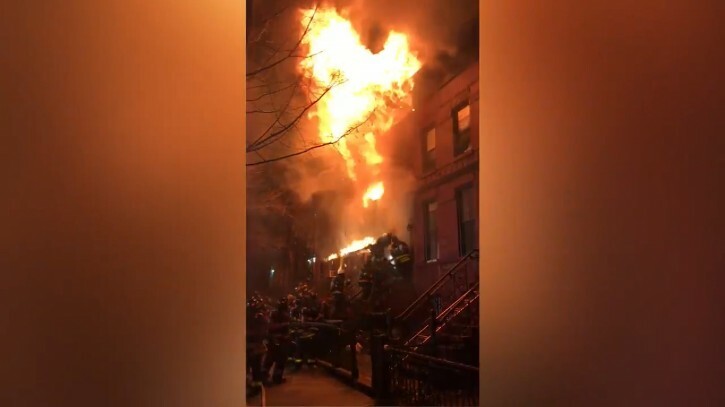 Brooklyn, NY - Dramatic video shows a piece of a burning home tumbling down on top of firefighters while battling a fire in the Bed-Stuy section of Brooklyn Monday. The three-alarm fire on Jefferson Avenue in Bed-Stuy injured at least four firefighters, one critically, after it broke out around 12:30 Monday morning, the FDNY says. The flames were brought under control about 3 a.m. Monday. Two of the firefighters were taken to the hospital, the others were treated at the scene. No residents were injured as they escaped the fire. 10 people were displaced by the blaze, according to the FDNY. The cause of the fire is currently unknown. the fdny is assailed every day in NYC bec. it lacks diversity since 95% of firefighters are white, straight males, the dept. of correction is reversed and literally people of starvation on rikers.